“A Day Without Me” was the first single released from the Boy album, U2’s fourth single overall, and the second single for Island Records in the UK. It was released on black 7-inch vinyl in both Ireland and the UK in advance of the album. It was also the first U2 single to be released beyond the UK and Ireland, as Island began testing the waters in other markets leading up to the release of Boy. In the Netherlands and Germany, a 7-inch was released, but instead of the image of the bridge featured on the sleeve for Ireland/UK, a variation on the Boy album cover, with slightly altered text, was used. In France, the 7-inch was released in a generic sleeve with the album version of “I Will Follow” on the flip side, instead of “Things to Make and Do.” “Things to Make and Do” was an instrumental track also recorded with Steve Lillywhite, which was the B-side in other regions. The release of “A Day Without Me” also played a key role in breaking the band in the US, when DJ Carter Alan, upon hearing it in a record store in Boston, MA, started playing it on his show on WBCN radio. It was one of the earliest plays of U2 on American radio, and WBCN would continue to push U2 on future releases. The single was also important because it marked U2’s first collaboration with Steve Lillywhite, who would go on to produce the band’s first three albums and who continues to work with the band to this day. 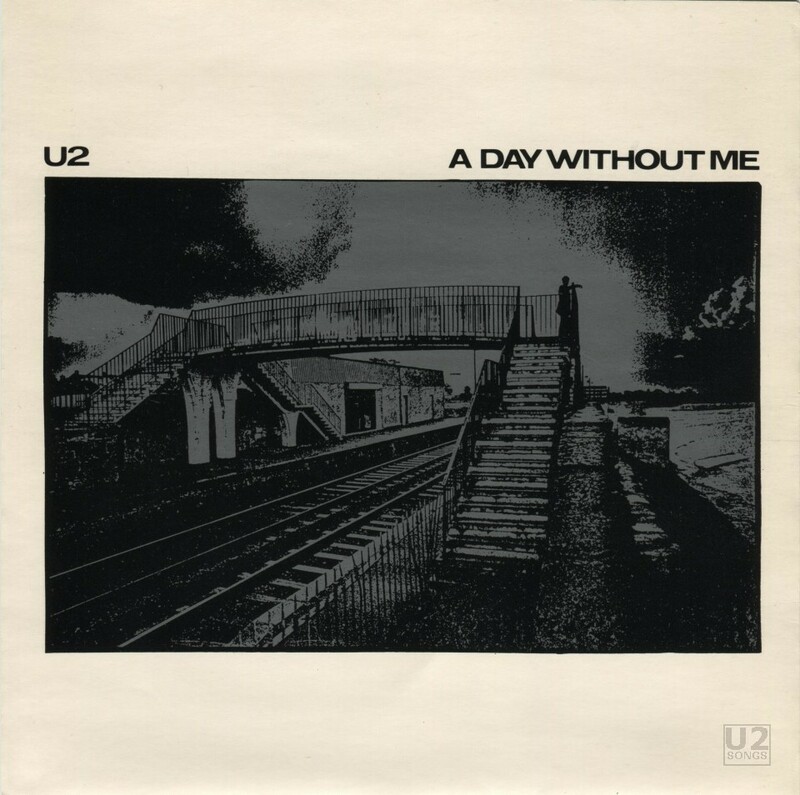 “A Day Without Me” was first played live in February, 1980 at the National Stadium show in Dublin, and quickly became a standard in the set list. It was performed throughout the early tours, and finally retired after the first twelve shows on The Unforgettable Fire Tour. It made a surprise reappearance decades later during the U2360° Tour, when Bono sang a short snippet during the band’s performance on August 15, 2009 in London, England. He incorporated the opening line, “Started a landslide in my ego” into “The Unforgettable Fire” on that night, and again in Glasgow a few nights later. “Things to Make and Do” was played throughout The Boy Tour, and just once on the tour promoting October, before disappearing from the live repertoire. It was the only instrumental regularly played during U2 concert tours until “Return of the Stingray Guitar” on the U2360° Tour. In the early 80s, CBS Ireland reissued a set of four of U2’s earliest 7-inch singles in the “4 U2 Play“ Pack. They chose not to include “A Day Without Me” in the initial set, opting for “I Will Follow“ instead. Demand for these early singles was high, and so “A Day Without Me” was included in a second set of singles dubbed “U2 Pac II.” Unlike the first grouping of singles, which included pressings on different colours of vinyl, the second set was only available on black vinyl. Remastered versions of both “A Day Without Me” and “Things to Make and Do” were released on the 2008 remaster of Boy, with “Things to Make and Do” available only on the second disc of b-sides and rarities included with the deluxe edition. A live version of “A Day Without Me,” recorded on July 4, 1982 in Werchter, was released as a b-side on some formats of the “New Year’s Day“ single (and was later included on the bonus disc accompanying the remastered War deluxe edition). On CD, this live version is preceded by a live take of “I Threw a Brick Through a Window.” Because these two songs were recorded back-to-back during the show, almost as a medley, they are combined into one track on CD, ie, “I Threw A Brick Through a Window/A Day Without Me [Live].” A live version of “Things to Make and Do” was released on the Live from Boston 1981 portion of the 2004 iTunes-only release The Complete U2. “A Day Without Me” was not part of that concert.